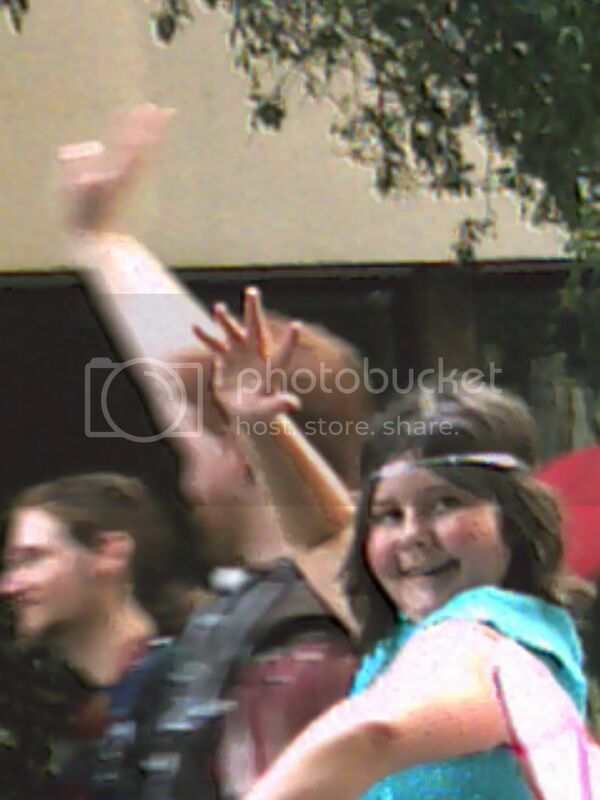 I have a pic of Kibby in the Dragoncon parade that is blurry. Is there anyway to fix it so it is not blurry, if so can one of you do it. I am not sure what happened in the photo. It is one that I had not messed with at all except to put in on a cd at wal mart. There is a different photo that I can use. Can you send me the original, Maw? I was going to say it looks like the original was taken with a disposable film camera, and the actual shot of Kibby is a (possibly very) small section of the original, probably enlarged on the Wal Mart machine that Maw used to put it on disk. I'm like Hans; I'd like to play with the original. What I have post is the orgainal. It went from the digital camera to the disc to the computer. It is the only copy I have. I haven't done anything to it. Maw, did you use the zoom on the camera to zoom in on her? Because I'm betting what we're looking at is digital zoom. I think her left arm moved. There also appears to be burn out around her left shoulder which makes it impossible to distinguish between the line of her left bicep and her left deltoid. I don't think the camera has a zoom. There is definitely a blur because of moving ut that normally doesn't create a pixelating effect. The pixilating looks like a low res camera (say a mobile). Maw: the movement may have been Kibbie herself. Well I will have use the other pic I have then. I like this one better because it is a head shot. The other one will work. Maw...too bad the *MoM photo repair squad* here can't fix Kibby's photo, as its a very cute one of her . It's a lovely pose of Kibbie, so a pity it came out blurred. Unless you need a picture of that particular parade my advice would be to take more pictures until you get another pose as good as that one. The strange effects on the photograph might be the result of too much compression. When you take a picture on a digital camera it is turned into information - a description of the photograph is stored on the memory card. Photographs need a lot of information to describe them ("a picture is worth a thousand words" is actually an underestimate!). Most cameras compress the information so that more pictures can be stored on the memory card. The compression removes information. You don't notice a small amount of compression because the information removed is irrelevant, but too much compression starts to spoil the photograph and add weird effects. It's like removing sentences from a novel to make it fit onto fewer pages. At first you may not notice; but remove too many and you start spoiling the story. Unfortunately, photoshop can't add back information that has been removed - you can make a fair attempt; like trying to second guess what the missing sentences in a novel might have said. Does your camera have a "quality" setting? Next time set the camera to its highest setting (it might be called "HIGH" or "FINE"). This will reduce the number of pictures you can fit onto your memory card, but it's worth it for the better quality pictures. I hope that helps. Kibbie's 4-H group is going to be having photography classes starting in Jan. I might learn something as well.